My break between classes today was the ideal time to take advantage of the above average temperatures outside. From my bench on the campus I had a good view into the churchyard next door and the diffused autumn light on the foliage, both distant and near. My aim was to capture, in paint, the glowing foliage and the branches of the trees which always look darker in contrast with the yellow leaves. I started my sketch by putting in lots of loosely defined areas of yellow, dropping colour into areas wet with clear water. As I built up the layers of foliage I also added in trunks and branches, darkening them in places where they wove in and out of leaves. I know these Indian Summer days are numbered, so best to get out there while I can. Thanks Deborah. The sketchbook I used today is the Travelogue Watercolour Journal by Global Art Materials. Reminds me so much of here..just up two streets! 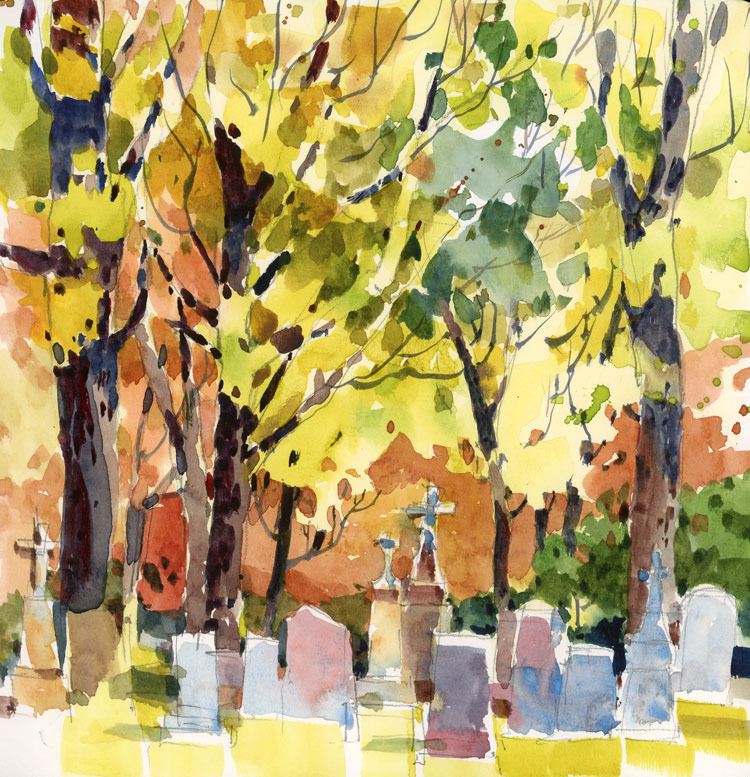 Great sketch of the cemetery… l love the shapes and shading with the headstones. On September 11 there is a sketch of my dog Alice. Were you trying to tell me telepathically that she needed a walk? If so, I did take her out for a long walk that day. Yes, your mind-control techniques are certainly working! I’m glad you found it useful Jane. I find foliage so challenging and I just can’t seem to get enough practice. You are very generous with your comments George. I really appreciate them. Beautiful. The colours on the monuments are really nice. Great depth of field. You brought me ‘there’. Always great to hear from you Chris. Thanks! Just lovely. I can almost smell the crisp air and hear the leaves rustling. I do love the fall season. I love painting in the fall Joan. For those same reasons.